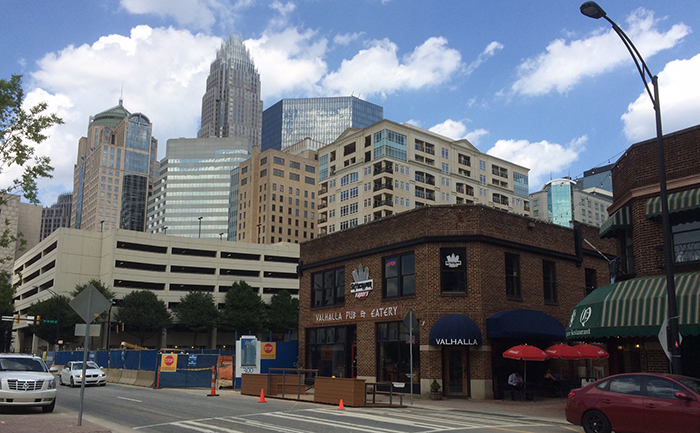 Parklets hit Charlotte today near Brevard Court. Here’s everything you need to know about these miniature parks, including where the idea came from to how you can get involved. A Parklet is an extension of the sidewalk over an on-street parking space that serves as a small public park. Streets make up the greatest amount of public space in Charlotte — Parklets help to take back some of that space and create areas for people gather or relax in a space that is open and accessible to all. Parklets are not unique to Charlotte. The idea started in San Francisco about 5 years ago and has been hugely successful. Philadelphia, Chicago, New York, Dallas, Seattle, Raleigh and many other cities all have programs as well. 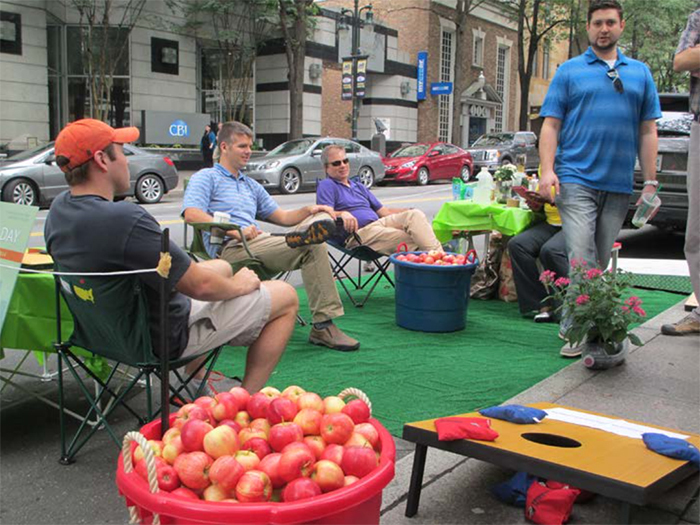 Charlotte participated in International Park(ing) Day last fall, during which eight parking spaces along Tryon Street in Uptown were converted into Parklets. 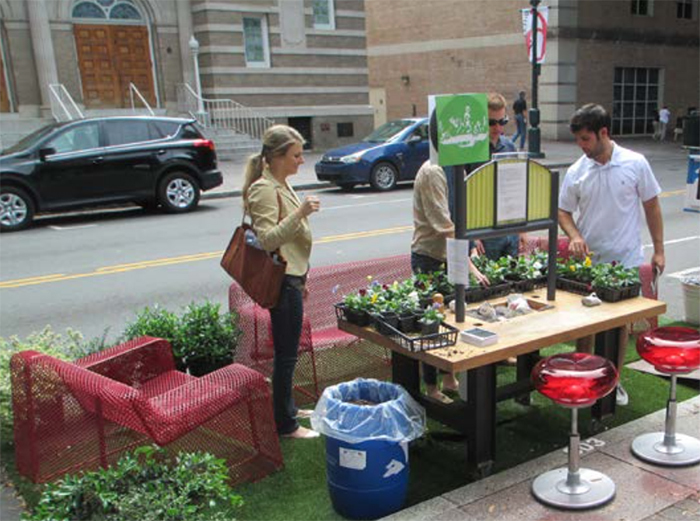 Building on the success of this event and the request and interest from Charlotte residents and business owners, CDOT launched a Pilot Parklet Program. 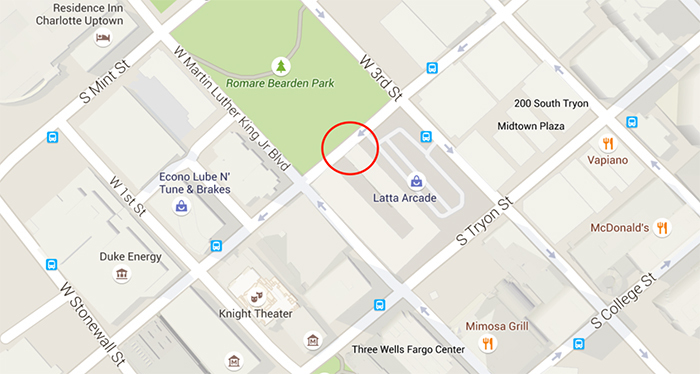 Where will these Parklets be located? Charlotte’s first Parklet is located on Church Street next to Brevard Court. This Parklet is part of the pilot program and will be closely monitored by CDOT to determine any improvements and whether this will become a permanent program in 2016. Additional Parklets may be located throughout town in areas with high pedestrian traffic. They will be built within marked, on-street, parallel parking spaces on streets where the speed limit is 35 mph or less. 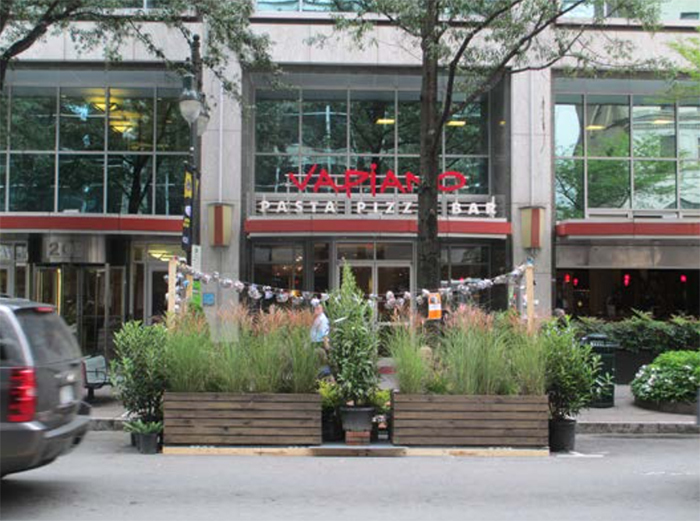 Who is responsible for creating and maintaining each Parklet? 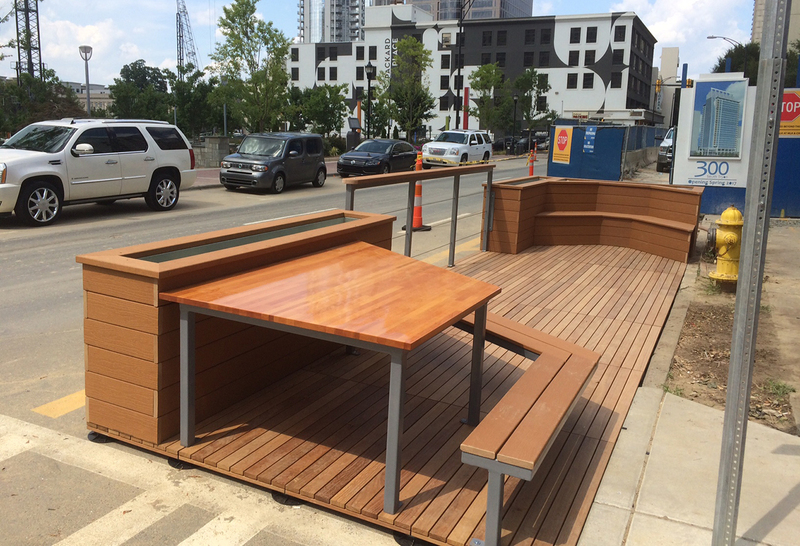 The Church Street Parklet is funded and constructed by Mecklenburg County Parks & Recreation and was designed in collaboration with the UNC-Charlotte School of Architecture and staff from Charlotte Center City Partners. CDOT is developing a pilot program that will allow individual residents and business owners to design, fund, build and operate their own Parklets. While Parklets may be privately maintained, they must be accessible and open to the public. Won’t they cause traffic and take up already limited parking space? Parklets will take up no more than two parking spaces and will only be permitted where parking is allowed at all hours of the day/night (not in parking lanes that are also used for traffic during rush hour). How is this different than a bench on the sidewalk? 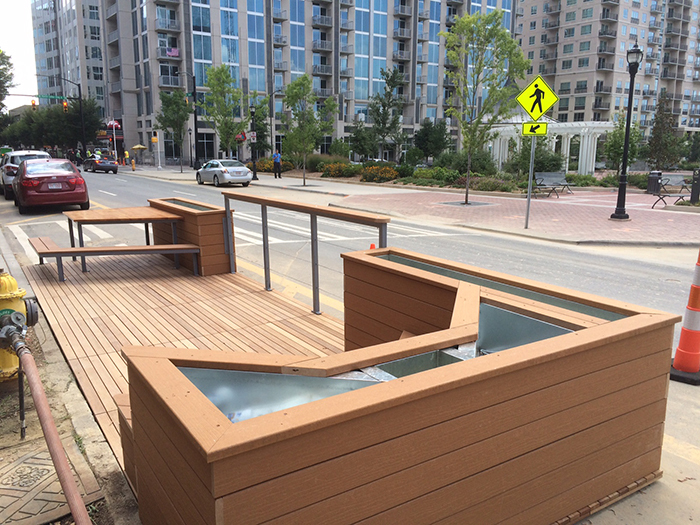 Each Parklet is contained within a defined space surrounded by barriers, such as planters or furniture. The design guidelines strongly encourage seating (fixed or moveable), year-round plants (preferably native and drought-tolerant), bicycle parking and construction materials that are local and sustainable. 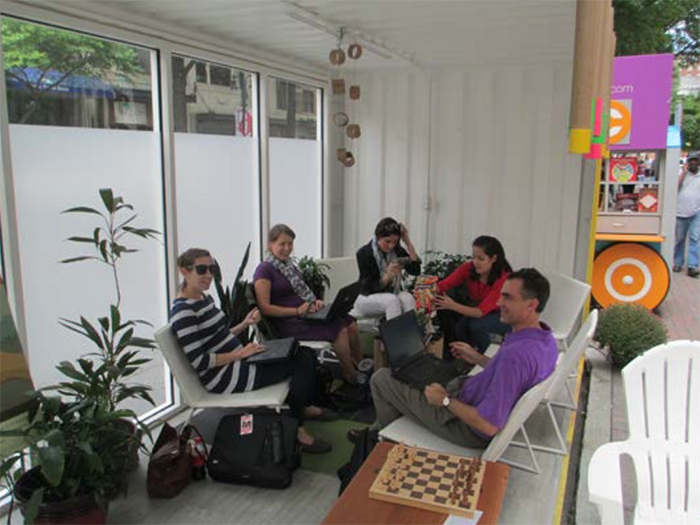 Additional Parklet amenities may include exercise stations, games, public art, places to eat, educational activities, reading areas, wifi access and canopies. Can I sell items from a Parklet? I want to create a Parklet, how do I get started? Anyone can submit an application to create a Parklet. In order to get started, you need to (1) select a location and run it by the CDOT Right-of-Way Management Section; (2) demonstrate neighborhood support from business owners, property owners and neighborhood organizations and (3) complete the Parklet application. Additional information and application can be found here. 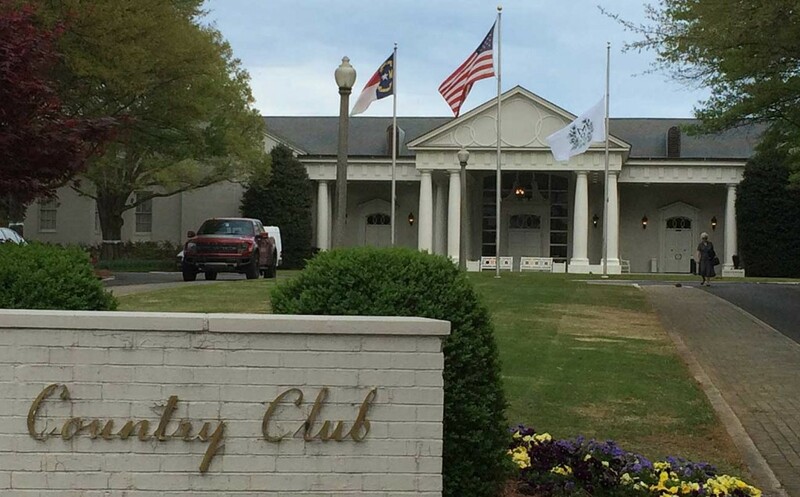 It’s currently free, but a fee structure is being finalized right now.